Looking for a weekend getaway from the frantic weekdays at Kolkata? Well, here is your destination this weekend. Midnapore is located in the vicinity of Kolkata and hence, is a definite getaway to peaceful and calm surroundings. From beautiful forests to ancient beauty, there is a lot to explore and savour in and around Midnapore. On the eastern side of Midnapore, you can enjoy its natural beauty in form of forests and parks and on the northern side, you can explore its majestic forts and buildings. So, why not set out and embark on a wonderful journey from Kolkata to Midnapore? As the summers are extremely hot in and around Midnapore, it is wise to avoid visiting Midnapore during the summers. The best time, when the temperature is optimum and climatic conditions are favourable, is from October until the end of March. By Air: The nearest airport is at Kolkata only, which is located at a distance of around 140 km from Midnapore. By Rail: There are direct trains available between Midnapore and Kolkata. You can catch a train directly from Kolkata railway station to Midnapore Junction. By Road: Midnapore is situated at a distance of around 130 km from Kolkata. Hence, it is easily accessible by road. While on your way to Midnapore from Kolkata, you can take a break at Tamluk and explore its historical places. Once you have reached Bagnan, which is at a distance of around 55 km from Kolkata, you can turn left and set for Tamluk which is located at an approximate distance of 35 km from Bagnan. Tamluk is located in the Purba Medinipur district of West Bengal on the banks of Rupnarayan river and is popular amongst tourists for its historical monuments which are in dilapidated condition. However, one can still read about its history through its ruined structure. Tamluk is located at a distance of 85 km from Midnapore and hence, it is the perfect place to take a break in between Kolkata and Midnapore. You can also roam around the cool surroundings of Rupnarayan river and explore its waters through a boat ride. Located on the banks of Kangsabati river, Midnapore is home to natural as well as historic beauty. A number of historical sites have been excavated in the Midnapore district and hence, it has become a weekend destination for local tourists. Even though the exact history of the district is unknown, it is believed that the town has been in existence since the time of Samudragupta. Apart from its historical significance, Midnapore is also popular for its green surroundings in the form of forests and parks. The beauty in Midnapore ranges from heritage parks to ancient buildings. So, how about exploring this wonderful place? Following are the major places to visit in and around Midnapore. The town of Midnapore is known for its temples which dateback to the 10th century. The Chapleshwar and Mahamaya temples, which are located at a distance of around 10 km from the town, are some of the most visited temples and are popular amongst tourists for their beautiful Odisha style of architecture. Kali Temple located in the town is another famous temple and is built in Pancharatna style of architecture. Chandrakona is another tourist place which is located at a distance of around 50 km from Midnapore. This ancient place is dotted with several ancient monuments which include Ramgarh Fort, Mahadev Temple and the Palace of King Chandraketu. It has been ruled by Chauhan Kings; hence, several traces of their presence can be found through these architectures. Another major place which should not be missed when in Chandrakona is Prayag Film City, which is the world's largest film city. Jhargram is located at a distance of around 40 km from Midnapore and is a perfect place if you desire to explore the natural surroundings of Midnapore. Jhargram is famous amongst local tourists for its deer park, rich forests and royal palaces. You can find a better place in and around Midnapore if you are looking to spend some unforgettable time amid the silence of nature. The major places to visit in Jhargram include Jhargram Palace, Radha Krishna Temple, Jhargram Deer Park, Chilkigarh Raj Palace and Jhargram Forest. Apart from temples and places, Midnapore is also home to several churches. St John's Church is the most popular amongst them on account of its age-old complex. You can also visit the ancient graveyard which is located next to this beautiful church. You can also visit Gopegarh Heritage Park in the town of Midnapore, which houses several ruined monuments dating back hundreds of years. 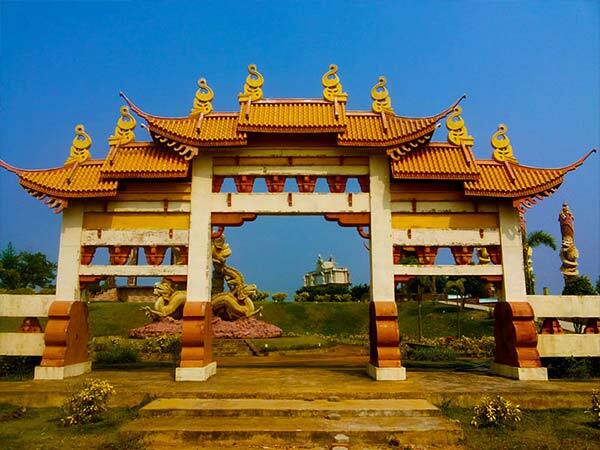 The lush green surroundings of Gopegarh Heritage Park will definitely compel you to visit Midnapore again and again.